‘Abu Dhabi Retirement Pensions and Benefits Fund is a trusted custodian and investor of our citizen’s savings and long term prosperity. By partnering with the Fund, Adnoc will play an important role in ensuring the financial wellbeing of the UAE’s people,” stated Dr Al Jaber. “This follow-on investment will generate solid, long term value and returns to Abu Dhabi Retirement Pensions and Benefits Fund stakeholders,” he added. “In addition, it demonstrates Adnoc’s progressive and smart approach to unlocking value from its portfolio of assets while retaining control over their ownership and operation,” stated the minister. 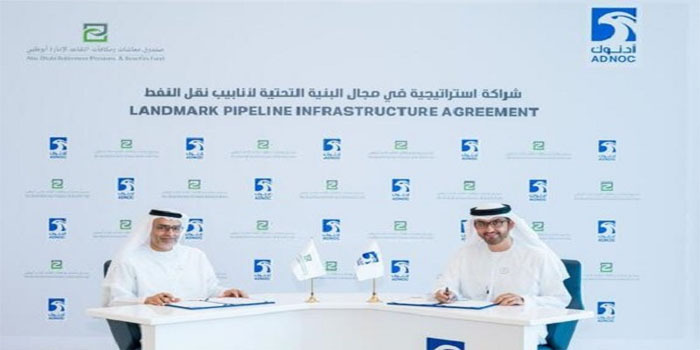 “This transaction is an extension of our keen effort to create a solid base of investments in the UAE through partnerships with major local companies such as Adnoc,” he noted. “With the ease of procedure and continuous support in terms of economic legislations, the UAE is an attractive investment environment. Moreover, this investment will guarantee the diversification of our investments, which will in turn serve our long term priority of continuous prosperity and financial security of UAE citizens,” he added.